DPB-320 Model Flat Plate Auto Blister Packaging Machine is high-tech products packaging machine for aluminum-aluminum, aluminum-plastic, paper-plastic. It is adopting micro-computer PLC, with frequency converter, man-machine interface operation, all round-function, ease of operation, stable running, qualified with GMP. Because of its large forming area and more plates for one cutting (standard sheet: 5 plates once), to a certain extent, it meets the needs of enterprises that have scale putout, especially the candy and milk tablet etc packaging in the food industry. The products have been appraised as the provincial science and technology accomplishments. 1、 Blister forming, hot-sealing, lot number printing, avulsion line impressing and cutting etc all adopt mandrel orientation, each can move freely in the mandrel when shaking the hand wheel, and with staff gauge, easy to adjust and exact orientation. 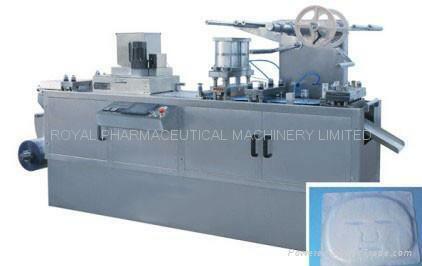 2、 Manipulator towing, adjustable travel range, which can fit for medicine-card packaging of different sizes. Without altering the cam lift circumstances, it adopted culms double pendulum device, thus prolonging the towing trip (it can be reached 200mm). The machine can registration heating, positive forming, up and down netted, air cylinder heating sealing, automatic feeding, automatic lot number printing, automatic cutting die, easy to operate and credible running. 3、 Forming positive pressure air distribution with mechanical punch, ensuring blister forming well, and could collocate exclusive Automatic Feeder. It could fit for the packaging of ampoule, needle, injector and Chinese traditional medicine big pill etc. 2、It can optional add ink-jet printer. 3、It can optional Plexiglas Cover.